Your “Why” To Be Fit – Is Your Discipline A Myth? Fitness and health starts with your mindset. Ask any athlete or fit person what the number one secret is to his success at fitness, and they will tell you it is commitment. If you dive even deeper and peal the onion, you will find that commitment has a whole different story or a deep ingrained “WHY”. It is this story that we want to share with you. 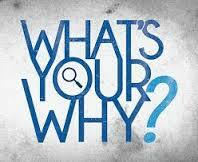 This “why” means that you are in it for the long haul. The “why” rises above bad days, hectic schedules and volatile emotions. The “why” hangs in there when you don’t want to do it, when you don’t feel like doing it and when you don’t have time to do it. The “why” doesn’t depend on how you feel. It depends on your integrity and living for the purpose you have set for yourself. Are you committed to your “why”? Someone’s “why” may not actually be real for someone who lives the weekend warrior syndrome. You may know a weekend warrior. He is the person who does little physical exercise during the week, but when the weekend arrives, he blasts out of the gate like a stallion on Derby Day. In a desperate attempt to make up for his sedentary behavior all week, he goes to the gym or hits the pavement, pushing himself to the limit. This will sound corny to the men who are reading this, but it is not discipline that drives me to my lifestyle, its love. You are the result of what you love most. Lots of people love golf. They practice their craft, they get lessons, they buy the best equipment etc. What we do is no different. I love working out, I love eating healthy, I love that it makes me feel good, I love that my body does not ache after I workout. I love that I don’t drink and have a hangover the next day. I love the feeling of an awesome nights sleep. I love having the energy to play with my kids all day. You see, it’s not discipline that drives me. I just know how all these healthy habits make me feel. These have become my “why’s”. I remind myself everyday and when I get off track, I write these why’s down. My discipline is not the reason I falter. Its because I am imperfect and I need to remind myself on a daily basis my true “why”. But the real rewards come when you commit to being consistent with respecting that you love yourself and that your choices are a reflection of managing “YOU” UNIVERSITY. When you truly make a loving choice, tell yourself , “Thank you for taking care of me in a loving way”. Talk to yourself as a loving parent. Wouldn’t you tell your child that making healthy consistent choices is a great thing? When faced with a difficult choice, ask yourself; would a loving knowledgeable coach recommend the poor choice? You can start today. Don’t overthink this. Just find your “why”. This article does a great job at looking into finding your why.